Church based in the Indian state of Kerala. The Mar Thoma Church, often shortened from Malankara Mar Thoma Syrian Church, is a Western Syriac Christian Reformed Oriental Church based in Kerala, India. The Mar Thoma Church believes that they are the successors of the Saint Thomas Christian community of Malabar (Malankara), which originated from the missionary activity of Thomas the Apostle in Malankara (historical name of modern Kerala). The Church in Malankara flourished under various ecclesiastical faith streams from time to time. The Mar Thoma Church is an autonomous Oriental church with Syriac traditions and eclectic characteristics from the Reformation era. Apart from other oriental orthodox churches, Mar thoma church reformed its west syriac liturgy in the light of its reformed faith and practices. The church defines itself as "Apostolic in origin, Universal in nature, Biblical in faith, Evangelical in principle, Ecumenical in outlook, Oriental in worship, Democratic in function, and Episcopal in character". The Malankara Church witnessed a Reformation movement during the nineteenth century, inspired by contact with Anglican missionaries from Britain. Many in the church were fascinated by the reformation principles. The reformation was an attempt to eliminate certain practices prevalent in the Malankara Church which the reformers believed were brought about after the Synod of Diamper. Beginning in 1840, reform-minded Malankara Church clergyman Abraham Malpan instituted changes independently in his parish at Maramon, including holding services in the local language, Malayalam, rather than the traditional Syriac language, and making other revisions to the Holy Qurbana like removing intercessional prayers to Mary and the Apostles. This led to a rift in the church hierarchy between Abraham's supporters and the metropolitan bishop, Mar Dionysius IV. Abraham Malpan sent his nephew, Deacon Mathews, to the Syriac Orthodox Patriarch of Antioch to be consecrated as Bishop Mathews Mar Athanasius. The leadership dispute was settled in 1852 with Mathews Mar Athanasius being recognized as Metropolitan, serving until his death in 1877. However, the rift never healed, and ultimately the Malankara Church split into the reformist faction headed by the reigning Metropolitan and the Jacobite faction headed by the Patriarch of Antioch in 1889. The reformist faction was renamed to form the Mar Thoma Syrian Church in 1898. In 1940 a schism formed in the Mar Thoma Syrian Church over the extent of Reformation theology; the modern reformists founded the St. Thomas Evangelical Church in 1961. Until the beginning of the 20th century, Mar Thoma Christians lived in a few districts of Central Travancore and Kunnamkulam in Kerala. Since that time they have spread with the 20th-century Indian diaspora to North America, Europe, the Middle East, Malaysia, Singapore, South Africa, Australia and New Zealand. The church currently has around 15,00,000 members in Kerala, and another 1,000,000 throughout the diaspora. Their mother tongue is Malayalam, the language of Kerala, and historically the variety known as Suriyani Malayalam was associated with them. Malankara Mar Thoma Syrian Church is commonly called the Mar Thoma Church. In official and legal record the church is referred to as Mar Thoma Syrian Church of Malabar or as Malankara Mar Thoma Syrian Church . Malabar is a term used to denote the Kerala coast in earlier days. The original Church was referred to as the Church of Malabar by the Jesuits and as the Syrian Church of Malabar in Missionary Registers from 1801 onward.Malankara is an ancient name derived from the name 'Maliankara', Maliankara Island is on the Southwestern side of the Indian Peninsula. It is between Gokarnam and Kanyakumari the southern-most point of India. Kerala, the present southwestern state of India is only a part of Malankara. It is also thought to be a cognate of this name Maliankara, a place near Muziris, where Thomas the Apostle first landed in Kerala. Mar Thoma is Aramaic, and means Saint Thomas. Members of the Mar Thoma Syrian Church are commonly called as Mar Thomiyar, Mar Thomites or Mar Thoma Syrians. The original liturgical language used by Saint Thomas Christians was the East Syriac language which is a variant of Aramaic. The Reformation movement in the Malankara Syrian Church later resulted in the evolution of an independent indigenous Malankara church under the Mathoma Metropolitan, breaking all the ecclesistical and temporal control from outside Malankara. In 1898, during the reign of Titus I Mar Thoma the church accepted as its name Malankara Mar Thoma Syrian Church or Mar Thoma Syrian Church of Malabar to comprise its order and heritage. The members of this church are known as Mar Thoma Nasrani or Mar Thoma Syrian Nasrani. The Mar Thoma Syrian Church has a well-defined constitution and has a democratic pattern of administration. The central administrative setup consists of the Metropolitan, the Episcopal Synod (Consisting of all the Bishops of the Church]), the Prathinithi Mandalam (House of Representatives) and the Sabha Council (Executive body of the house of representatives / Mandalam), and the Vaideeka Selection Committee (to select candidates for the ordained ministry of the church). The Central Administration of the Church is backed by the Dioceses. Each diocese has its own council and an assembly. The assembly members are elected by the individual parishes, and the diocesan council members are elected by the assembly. All members of a parish are members of the Edavaka Sangham (General Body) and they also have the right to elect their representatives to the Diocesan Assembly and Prathinidhi Mandalam, (Church Parliament). The title of the head of the Church is "Mar Thoma Metropolitan". He is ordained from among the duly-consecrated bishops (Episcopas) of the Church, the choice being ordinarily that of the senior most among them. The present "Mar Thoma Metropolitan" is Joseph Mar Thoma who resides at Poolatheen at Church Headquarters in Tiruvalla, Kerala. He is the 21st Mar Thoma in the line of continuation after the re-establishment of the Mar Thoma episcopacy after the Oath of the Koonan Cross (1653). If the Metropolitan is personally satisfied that he has difficulty continuing to perform the duties pertaining to his office, he may relinquish the powers and responsibilities of Metropolitan. Then he becomes the Mar Thoma Metropolitan Emeritus and is addressed as "Mar Thoma Valiya Metropolitan". The present "Mar Thoma Valiya Metropolitan is Philipose Mar Chrysostom Mar Thoma Valiya Metropolitan. To assist the metropolitan there are Episcopas, the senior most among them is called the Suffragan Metropolitan. The Synod of 1876 (Mulanthuruthy) and the Royal Court Verdict of 1889 was the turning point in the history of the Puthenkoor Syrians of Malabar. The Reformist (Metran) faction continued to consecrate bishops to the Malankara See without the consent of Patriarch as they claimed Malankara church is independent from the Syrian Church. Before the death of Malankara Metropolitan Mathews Mar Athanasius, he consecrated Thomas Mar Athanasius as Suffragan bishop of Malankara Church. Following the death of Mathews Mar Athanasius, the suffragan succeeded as the Metropolitan of the Malankara See in 1877 which led to a schism in the Malankara church. Those who supported reformation loyally followed the Malankara Metropolitan who was legally evicted from the Malankara Syrian Church. He died in 1893 without consecrating a successor and suggesting a new name for the church. The Metropolitan of Malabar Independent Syrian Church stepped in and consecrated Titus Mar Thoma as the new bishop. For the consecrations, from 1917 onwards bishops from other churches were invited as guests. But the consecration was done only by the Metropolitan and was assisted as witness by the other Bishops of the Mar Thoma Church and of the Malabar Independent Syrian Church. Geevarghese Mar Athanasius Suffragan Metropolitan (Age: 74), was consecrated by Alexander Mar Thoma Metropolitan on 9 December 1989. He died of kidney failure on 18 April 2018. Zacharias Mar Theophilus Suffragan Metropolitan (Age:77), was consecrated by Alexander Mar Thoma Metropolitan on 1 May 1980, at Tiruvalla. He died on 27 December 2015 of a cerebral hemorrhage and was interred at the Bishops Cemetery of S.C. Church, Tiruvalla on 29 December 2015. Easow Mar Timotheos Episcopa, was consecrated by Juhanon Mar Thoma Metropolitan on 8 February 1975. He Died on 11 April 1988 in Port Blair and was interred at S.C. Church, Tiruvalla. Thomas Mar Athanasius Suffragan Metropolitan, was consecrated by Juhanon Mar Thoma Metropolitan on 23 May 1953, at Tiruvalla. Died on 27 November 1984 and was interred at S.C. Church, Tiruvalla. Mathews Mar Athanasius Episcopa, was consecrated by Titus II Mar Thoma Metropolitan on 30 December 1937. Died on 23 September 1973 and was interred at S.C. Church, Tiruvalla. Semmasan (deacons): The Sabha Prathinidhi Mandalam elects a Vaidika Selection board to select candidates for the ordained ministry of the church through recommendations (letters from bishops-clergy by the level of exposure in church or by personal sponsorships of bishops or written support pledged from bishops), exams (English, General knowledge and Bible) and pre- and post- theological training interviews (with theological-sociological aspects and scrutiny through psychological and health evaluations). Following a The Church of Jesus Christ of Latter-day Saints tradition and from diasporic influence, the church follows a compulsory twelve month (or 24 month with relocation, if failed in first attempt) unpaid missionary service to those who are inclined to be a priest, before selection process as a "Tithe of Youth" program for "evaluation purposes". Additionally this program was challenged in youth meets of the church at the time of its conception on the basis of non-guarantee in entry, fast changing world, career stagnation, and other economic factors and have arrived at a discussion level resolution of implementing this process after the pursual of their theological training and integrating the "Deacon" status during the time period under mentorship which enables the church to fill up ngo's, projects and mission fields with trained and theologically equipped individuals for staff duties and pastoring, thus avoid stress and negligence that would be otherwise imparted on the youth. During the intensive field trainings, when the inclined candidate is counted to be worthy for controlled influx in church duties, the trained and experienced Deacon's can be nominated for ordinations as Kassessa's, by each diocese as the allotment. Kassessa (clergy): Persons receiving ordination as ministers shall be duly ordained deacons. They all have had their Bachelor of Divinity degree from the Mar Thoma Theological Seminary, Kottayam, Kerala, or from other recognized theological seminaries of India. The wife of a Kassissa is known as "Baskiamma". Vicars general: From among the clergy who have completed 25 years of service in the ordained ministry and not less than sixty years of age are selected according to their contributions and ordained as vicars general. In the absence of the diocesan bishop, they may be appointed as deputy head of the bishopric. Thomas Christians are popularly and traditionally called as Syrian Christians, in view of the Syriac liturgy (a variant of classical form of Aramaic) used in church services since the early days of Christianity in India. The Saint Thomas Christians remained as Church of Malabar with fraternity relationship with Church of East, Church of Antioch, Church of Alexandria etc. till Advent of Portuguese and Jesuits of Roman Catholic church in 15th century . There after the Christians of St Thomas had been influenced by many belief streams at different points of time. These influences have later resulted in serious rifts and in the breaking down of the monolithic apostolic church to different fragments under different faith stream. They were organised as a Church in the 8th century, served by foreign bishops and with a hereditary local chief called Arkadiyokon or Archdeacon. In the 16th century the overtures of the Portuguese padroado to bring the Saint Thomas Christians into the Latin Rite Catholicism led to the first of several rifts in the community and the establishment of Latin Catholic and Malankara Church factions. Since that time further splits have occurred, and the Saint Thomas Christians are now divided into several denominations, each with their own liturgies and traditions. Muziris, near the tip of India, in the Peutinger Table. On the south western side of the Indian peninsula; between the mountains and the Erythraean Sea (now Arabian Sea); stretching from Kannur to Kanyakumari was the land called Cherarajyam, which was ruled by local chieftains. Later this land came to be known as the Malabar region and (now Kerala). Muziris (near Kochi) was the important entry port. After the discovery of Hippalus, every year 100 ships arrived here from various parts of the then known world, including Red Sea ports. During the time of Moses and Solomon, the Malabar Coast traded spices and luxury articles with Israel. Excavations carried out at Pattanam (near Kochi) from 2005 provided evidence that the maritime trade between Kerala and the Mediterranean ports existed even before 500 BC or earlier. It is possible that some of those traders who arrived from the west, including Jews, remained in Kerala. While Augustus (31 BC- 14 AD) was the Roman emperor and Herod the Great (37–4 BC) was King of Judea, ambassadors from Malabar visited the Emperor according to an account of Nicolaus of Damascus. Certain nasrani writings hypothesize that these ambassadors were the Biblical Magi of Matthew 2:1, as a tradition. Saint Thomas Christians believe that Thomas the Apostle arrived in Kerala around AD 52. He landed at Muziris (now estimated as Pattanam, near Kochi on the Malabar Coast), after his first mission in the Parthian empire, during the era of King Gondophares It is believed that St. Thomas itinerated for 30 years in Kerala and proceeded to the East coast of India from Malankara and died a martyrs’ death at a place called Mylapore-Chinnamalai in Tamil Nadu. The Nazarenes in Malabar were either proselytized from mainstream Judaism by 'Mar Thomas' or 'Mar Bartholomeu'. Pantaneius's reference to the gift of 'Gospel of Matthew in Hebrew' by Bartholomeu to the Nazereans in Malabar is a clear pointer to the fact that Mar Thomas did evangelize Malabar, It could be further stated that either Mar Nathanael (John 21:2) aided in Mar Thomas' mission in India for a brief time before heading to Armenia or bar-Tau'ma, Son of Thomas assisted in his father's missionary activities per norms in LEV 21:7, this could also explain why most of the priests in the order of St. Thomas were later allowed to be married, which led to the prerogative of sacerdotalism to certain groups/families and to people supported by them. In early Christian times, 'Nazranis' were not a separate religion, but a sect in the Jewish community. The term was used to denote followers of Jesus of Nazareth. (Acts. 24:5; 28:22). 'Khristianos' (or Christians) was initially used largely to refer non-Jewish people who followed Christ (Acts 11:26). In Kerala, the sect was known as 'Nazraani Margam'. Margam in Malayalam means, 'The Way'. (Acts 9:2; 19:9, 23; 22:4; 24:22). Thus, the word Nazraani clearly shows that many who joined them were Jews. But in Kerala this name was replaced by the word 'Christians' in the 20th century. The earliest families within the Jewish community to accept the path of Christianity through St.Thomas, later intermarried with the ethnic local community and Brahmins of the 6th century. This led to the upbringing of marginal class or 'sambandham' brahminic family clans like Pakalomattom, Sankarapuri and Kalli to a different socioeconomic status, they are now widely accepted as the first families who adopted an emigre way of life or 'Christianity' in Kerala. According to recent DNA research by Dr. Mini Kariappa, a significant number of Knanaya's share their ancestral roots with the West Eurasian gene pool of Jews. Saint Thomas Christians were administratively under the single native dynastic leadership of Arkadyaqon (East Syrian term for an ecclesiastical head with extensive administrative powers, deriving from Greek αρχιδιάκονος = archdeacon) commonly referred as "Jathikku Karthavyan" ( Malayalam term meaning "Leader of The Community"). The Malankara Church believes that St. Thomas appointed elders at every place he preached to lead the believers. He prayed and laid his hands upon them, in the same way as the other disciples did. This was the system used till the arrival of Portuguese. By 1500, Malankara Church had Parish elders and a Church leader. Before the arrival of Portuguese, Latin was unknown to Malankara people. In the ‘’Decrees of The Synod of Udayamperoor’’ presented to the St. Thomas Christians in their mother tongue Malayalam, Malankara Mooppen was the name used to refer the Church leader, except on three occasions. During the period of Colonialism, (i.e., from the 16th century), the Portuguese Jesuits began deliberate attempts to annex the community into the Latin Rite of the Catholic Church, and in 1599 AD, they succeeded in their attempt through the infamous Synod of Diamper. Resentment against these forceful measures led the majority of the community under their Arkadyaqon Thomas to swear an oath never to submit to the Portuguese, known as the Coonan Cross Oath in 1653. For the first time in 1653 the Church leader was given the title Mar Thoma when Thomas Arkadyaqon was consecrated as Mar Thoma I. The present head of the Mar Thoma Church is the twenty first Mar Thoma. In the 2nd century (189-190 AD) AD, Pantaenus, the Philosopher and Missionary sent by Bishop Demetrius of Alexandria to India, found that there were many Christians in India with a Persian Bishop and that they had a copy of the Gospel according to Matthew in Aramaic. These Christians were the early evangelists of Malankara Church. During the time of King Shapur II (310–379) of Persia, a group of 400 immigrants (72 families) from Persia arrived in Malabar under the leadership of merchant Knai Thomman. They were engaged in trade and settled down in Kodungallur. Another immigration from Persia occurred around 825 under the leadership of Persian merchant Marwan Sabriso, with two Bishops, Mar Sapro and Mar Prodh. Together they were known as Knanaya/Kanai people. They continued to remain partially in an endogamous group within the Nasrani community. They cooperated with the Malankara Church, attended worship services together but remained a separate identity. By the 10th century, in Malabar there were two Nazrani groups, the Saint Thomas Christians and Knanaya community. Following the arrival of Christians from Persia, their bishops, priests or laymen began visiting them. Most of them were not able to return due to financial difficulties and travelling long distances. The Knanaya people were worshipping together with the St. Thomas Christians. So these visitors also attended these services. It was a matter of ongoing dispute between different churches in Kerala whether the Syrian bishops had any administrative responsibility or jurisdiction over the St. Thomas Nazrani Christians. 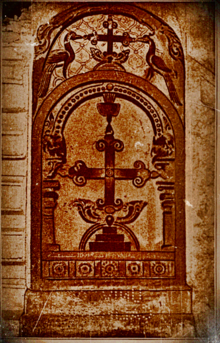 Persian crosses were in churches once attended by Nasranis. Out of five Persian crosses two are in Kottayam Knanaya Valia Palli. According to the archaeologists, the earliest one was made in the 7th century. The cross became a symbol of Christianity in the west, during the time of Constantine (272–337). Saint Thomas Christians of Malabar had hardly any contact with other Christians before the arrival of Knanaya people from Persia. Moreover, two of the oldest church buildings that still exist in South India do not have any marking of a Cross on their original structure. So most probably it was during the 7th century that the cross became a symbol of St. Thomas Christians. The existence of this Church in early centuries is evident in the writings of ancient travelers. 325 AD – It is recorded that there was a Syro-Chaldean bishop John "from India and Persia" who assisted at the Council of Nicea in 325 AD. 522 AD – an Egyptian Monk, Cosmas Indicopleustes in his writings, ‘’Universal Christian Topography’’ mentions that there was this Church with a bishop from Persia. 883 AD. – Alfred the Great (849–899), King of Wessex, England reportedly sent gifts “in India to St. Thomas and to St. Bartholomew”, through Sighelm, bishop of Sherborne. 1225 AD. – Chau Ju-Kua a Chinese traveller visited Kerala. The rulers of Kerala, in appreciation of their assistance, had given to the Malankara Nazranis, three deeds on copper plates. These are known as Cheppeds, Royal Grants, Sasanam etc. Five sheets of them are now in the custody of the Malankara Mar Thoma Syrian Church Headquarters at Thiruvalla. Tharissa palli Deed I: Perumal Sthanu Ravi Gupta (844–885) gave a deed in 849 AD, to Isodatta Virai for Tharissa Palli (church) at Curakkeni Kollam. According to historians, this is the first deed in Kerala that gives the exact date. Tharissa palli Deed II: A continuation of the above deed was given sometime after 849 AD. The Portuguese started settling in India with the arrival of Vasco da Gama in 1498. For the next 200 years they took control over the sea routes and were powerful in the western parts of India. By 1500, Malankara Church was spread from Kannur in the North to Kollam in the South. It included the Saint Thomas Christians and the endogamous group, Knanaya Christians. The Saint Thomas Christians went through changes with the encounter of Portuguese in 1599. In the 16th century the overtures of the Portuguese padroado to initiate the Saint Thomas Christians into the Catholic Church led to the first of several rifts in the community and the establishment of Roman Catholic and Malankara Church factions. Since that time further splits have occurred. The Malankara Church had hardly any contact with the Western Church. The Portuguese used their power to bring the Malankara Church under Latin jurisdiction. A powerful Archbishop Aleixo de Menezes arrived in Goa in 1595. He then convened a Synod at Udayamperoor, south of Ernakulam, from 20–26 June 1599, known as the Synod of Diamper. Here the Archbishop demanded complete submission to the Latin jurisdiction. The representatives sent from various parishes in and around Cochin were forced to accept the decrees read out by the Archbishop. A protest took place in 1653 with the Coonan Cross Oath. Under the leadership of Archdeacon Thomas(Mar Thoma I), the Thomas Christians publicly took an oath that they wouldn't obey the Jesuit bishops. Rome sent Carmelites in two groups from the Propagation of the Faith to Malabar headed by Fr. Sebastiani and Fr. Hyacinth. Fr. Sebastiani arrived first in 1655. He began to deal directly with the Archdeacon Thomas, (Mar Thoma I). Fr. Sebastiani gained the support of many, especially with the support of Palliveettil Mar Chandy, Alexandar Kadavil and the Vicar of Muttam. These were the three councilors of Mar Thoma I, who were reconciled with Gracia (SJ)[who?] before the arrival of Sebastaini, according to Jesuit reports. The Roman Catholic faction persistently challenged the validity of the ordination of Mar Thoma I by laying hands of 12 priests. It led many people to believe what they said and chose to rejoin with the catholic faction. Between 1661 and 1662, out of the 116 churches, the Carmelites reclaimed eighty-four churches, leaving Archdeacon Mar Thomas I with thirty-two churches. The eighty-four churches and their congregations were the body from which the Syro Malabar Church has descended. 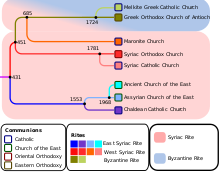 The other thirty-two churches and their congregations represented the nucleus from which the Syriac Orthodox (Jacobites & Orthodox), Thozhiyur, Mar Thoma (Reformed Syrians), Syro Malankara Catholics have originated. In 1665 with the request of the Archdeacon, Gregorios Abdul Jaleel a Bishop sent by the Syriac Orthodox Patriarch of Antioch, arrived in India. A faithful group under the leadership of the Archdeacon welcomed him., the arrival of the Bishop Mar Gregory of the Syriac Orthodox Church in 1665 marked the beginning of a formal schism among the St. Thomas Christians. Those who accepted the West Syrian theological and liturgical tradition of the Syriac Orthodox Church of Antioch of Mar Gregory became known as the Jacobite, The Syrian Catholics remained in communion with Rome and later came to be known as the Syro Malabar Church. Under the leadership of their elder Thomas, Nazranis around Cochin gathered at Mattancherry church on Friday, 24 January 1653 (M.E. 828 Makaram 3) and made an oath that is known as the Great Oath of Bent Cross. The following oath was read aloud and the people touching a stone-cross repeated it loudly. Four months after this event, according to the beliefs, 12 elders of the church ordained the elder Thomas as their prelate with the ecclesiastical title Mar Thoma I. Their beliefs and practices before the arrival of the Portuguese as evident in the canons of the Synod of Diamper. maintained the spiritual presence of the body and blood of Christ in the sacrament. had no knowledge of the term purgatory, but prayed for the dead. had irregular practice of auricular confession. only had a few celibacy clergy in monastic rank, while celibate bishops visited periodically from the Middle East. The Dutch East India Company defeated Portuguese for the supremacy of spice trade in Malabar in the year CE 1663. Malankara Nazranis used this opportunity to escape from Latin persecution with the help of Dutch East India Company. The Dutch brought Bishop Gregorios Abdul Jaleel of Jerusalem of Syrian Orthodox Church in their trading vessel in CE 1665. Thomas Arkadyaqon who was consecrated as Mar Thoma I entered into a relationship with the West Syriac Orthodox Church and gradually adopted West Syriac liturgy and practices. The Dutch was on the Malabar Coast from 11 November 1604 - 1795. Mar Thoma I to Mar Thoma VI were the prelates during this period. The English defeated the Dutch in 1795 and took over Cochin during the time of Mar Thoma VI. In 1806, Rev. Dr. Claudius Buchanan, an Anglican missionary visited Malankara and met Mar Thoma VI. But, soon after this meeting, Mar Thoma VI convened a meeting of representatives of the parishes and declared that the Malankara Church should not follow the teachings of the churches of Rome or Antioch or any other foreign churches. The Bible that was translated from the original Aramaic into Malayalam by two Malpans (Syriac Professors) was printed with the help of Buchanan. In 1808, a bond for the sum of 3000 Star Pagoda (Rs.10,500) was handed over by Col. Macaulay, the British Resident in Travancore to the Govt. for Mar Thoma VII with the condition that the interest (known as Vattipanam) be paid to the Metropolitan of the Syrian Church of Malabar. Col Munro the British Resident in Travancore gave the interest of the deposit to Joseph Ramban due to misunderstandings and lack of regularized administration. In order to avoid the quandary in 1815, Joseph Ramban was consecrated by Mar Philexenos of the Thozhyoor Church and was given the ecclesiastical title Mar Dionysious. To make the Malankara Church accept him as their head, Col. Munroe had to get the rulers of Travancore and Cochin issue Royal proclamations ordering Christians to render obedience to Mar Dionysious. Ignoring this interference by the British, Mar Thoma VIII consecrated his successor Mar Thoma IX. But soon after, Pulikkottil Mar Dionysious dethroned him. The next two prelates were also selected by Col. Munroe and Royal proclamations were issued to them also. Cheppad Philipose Mar Dionysius (Mar Thoma XII) did not like the interference of the Anglican Missionaries. So he convened a Synod at Mavelikkara in 1836, in which the Synod declared that, “We, the Jacobite Syrians are under the rule of the Patriarch of Antioch.” But it is historically untenable to assert that the Malankara Church had always been under the Patriarch of Antioch. Abraham Malpan leader of the Reformation did not attend this meeting. After this the missionaries continued their work on their own. By 1878, CMS Church (Anglican Church) was established in Kerala with those who joined them and with those whom they converted. From 1498 India was under the Colonial rule of three European powers. They all brought in their beliefs, practices and traditions into the Malankara Church. The Cleansing of the Church was an attempt to eliminate certain such practices and bring back those prevalent in the Church of their fore-fathers. The reformation was carried out in dissidence by the members of a review committee of 12 scholarly clergy, appointed for a thorough study on the "necessary amendments that the church should adopt" at a meeting of representatives of the Malankara Church by Punnathara Mar Dionysious at Mavelikkara on 3 December 1818. No foreigner was involved in this plenary committee or in its deliberations. Though Maramon Palakunnathu Abraham Malpan was bounteous in his temperament he never hesitated to introduce reforms in both teaching and practice. He also insisted on a high moral standard of conduct for laity and clergy alike. All this created a ferment in the Malankara Church and its effects are still discernible in the Church as a whole. Icons, pictures, statues, and drawings of saints were removed from homes, churches, and places of worship. Considered the practice of praying for the dead and of doing obeisance at their graves with lighted candles as abhorrent. Intercession of saints and prayers for the dead were discarded. All prayers, worship and devotion to the Blessed Virgin Mary and the saints were omitted. All prayer requests to dead and prayers to uplift the dead from sin and suffering were omitted. Insisted that Sunday services are to be held in a reverent and spiritual way. During that time reading and expounding scriptures is to be done. Conducted worship services, including Holy Communion in the mother tongue, Malayalam. Holy Communion was not celebrated when there were none to receive. Mandated that communion under both kinds should be distributed separately. Believed that those who come for confession should ask for forgiveness with fasting and prayer, instead of offering oil, incense and candles. Insisted that bishops should ordain only candidates who have been examined by them and the malpans (Meaning:- Syriac scholars). Repudiated the custom of smearing charcoal on the forehead on Ash Wednesday. The Church unequivocally hold the doctrine of the Trinity as interpreted by the creeds of Nicea, Constantinople and Ephesus. The Clergy, is dedicated in avoiding benefices other than the regulated salary, as a part of the principle of simple life (a Christian ideal of being poor and humble with unclouded conscientious and to be guarded away from mortal greed) for self and the laity. The first printed Malayalam Bible, translated from Syriac was published in 1811. Known as Ramban Bible it contained only the four Gospels. By 1841, the whole Bible was translated, printed and released. Realizing the need for timely changes, in 1818 Mar Thoma XI convened a meeting of representatives of the Malankara Church at Mavelikkara. In that meeting a review committee was appointed to recommend reforms. Abraham Malpan, Kaithayil Geevarghese Malpan, Eruthikkal Markose Kathanar, Adangapurathu Joseph Kathanar were members of this committee. This was the first step in carrying out Reformation in Malankara Church. On 5 September 1836, the reformation was planned. Strategy was determined by a group of 12 clergymen under the leadership of Abraham Malpan. They issued an encyclical describing what they believed were the wrong teachings, a statement listing twenty-four practices of the Church which they believed were "evil" and had crept in by its association with other Churches and religions and the same as a petition to a British Resident. On 27 August 1837 (Sunday), then suspended Abraham Malpan conducted the Holy Communion service in mother tongue Malayalam at his home parish at Maramon. Clergymen, who supported him also did the same thing in various other parishes on the same day. Connected with a saint (Baselios Yeldo), every year in the first week of October, there was a church festival at Maramon. During that time a wooden statue of that saint, they called "Muthappen" (Meaning:- Elder father) was taken around in procession and people used to venerate the saint by offering prayers and ask for intercession. In 1837, Abraham Malpan from deeper biblical understandings and of the spiritual scruples surrounding it, took the statue and threw it into a well saying, “Why consult the dead on behalf of the living?” (Isaiah 8:19). So when the festival came there was no statue to be taken out for procession. The use of the revised liturgy and the changes he brought about in practices disgruntled Mar Thoma XII. So deacons trained under Abraham Malpan were refused priesthood. But Abraham Malpan was not disheartened. He continued with his spirited reforms. He returned to Maramon. Many of his students joined him to continue their studies. All those who believed that "The Church" needed a revitalization also joined him. Members of parishes in Kozhencherry, Kumbanad, Eraviperoor, Thumpamon, Elanthoor, Kundara, Kottarakara, Mavelikkara, Mallapally, and many other places made trips to Maramon to attend the service in Malayalam and listen to his sermons. Doors were also opened for reformation in other places by ministers who supported him. At this stage he had three choices in front of him. Repent and go to the beliefs under Antioch; join the Anglican Church with western theology and aid; or go forward with the Cleansing and restoring "The Church" to what he thought would bring it to a pristine position, A church uncontaminated by avarice, venality, licentiousness and rapacity. He selected the third one. Abraham Malpan died in 1845. Mathen, a motivated nephew of Abraham Malpan by his uncle's guidance and spiritual nurturing, went to Antioch and returned after two years. While there, he was consecrated by the Patriarch of Antioch, Ignatius Elias II with the title Mathews Mar Athanasius Metropolitan. After Cheppattu Philipose Mar Dionysius abdicated due to ill health - To collect the interest of the Vattipanam (Fixed Deposit), through a legal ordeal Mathews Mar Athanasius was approved as Malankara Metropolitan by the governments of Kerala and Cochin on 30 August 1852. Mathews Mar Athanasius published the liturgy without the prayer to St. Mary. He consecrated Ouseph Mar Koorilos, as Metropolitan/Bishop for Malabar Independent Church. The entirety of strong-arm actions incited many clergymen and Pulikkottil Ouseph Kathanar went to Antioch in 1864. He returned as Pulikkottil Joseph Mar Dionysious II in 1865. Pulikkottil Joseph Mar Dionysious II and his supporters filed a case on 4 March 1879. (Case O.S. No. 439 of 1054) demanding the possession of the seminary and the control of assets of the Church. Thomas Mar Athanasius was then the Metropolitan. The Episcopal throne of Patriarch is the throne of St. Peter, while the throne of Malankara Church is that of St. Thomas. Malankara Church is as old as the Church in Antioch, equal in status, and both are independent. Malankara Church was never under any foreign rule and that he was unwilling to move away from the teachings or give the authority and the Church possessions to a foreign Patriarch. The Metran Kakshi decided to remain as an independent Malankara Church, and to give primary authority to the Holy Bible and continue as the successors of St. Thomas throne. In 1898 this group chose the name Malankara Mar Thoma Suryani Sabha. Many in the Church was fascinated by Gandhian philosophy and particularly its Primates Abraham Mar Thoma, Yuhanon Mar Thoma and Alexander Mar Thoma were strong Advocates of Gandhian methods. They wore Ecclesiastical robes stitched from Khadi. The church actively worked in areas of education, empowerment of women, eradication of social evils and in self-reliance. Mar Thoma Sabha councils and Maramon Convention became a platform for disseminating Nationalist ideas. Many nationalist leaders like K. Keshavan, C. V. Kunjiraman, T. M. Vargheese, Pattam Thanupillai had used Maramon Convention to mobilize people against Divan Sir C.P. Ramaswami Iyer's move to form an Independent Travancore separate from India. In 1936 Kunjiraman through his speech at Maramon gave an ultimatum to Travancore Royalty to give freedom of worship in temples for all Hindus immediately or see mass conversions to Christianity. The practice of political leaders attending with the Christian gathering at Maramon has its origin from that period. Ramaswami Iyer liquidated the Quilon bank and sealed off Malayala Manorama, the leading newspaper, for criticizing the divan. Abraham Mar Thoma spoke about these notorious acts and visited those who were jailed by him. He further visited the Maharaja of Travancore and complaint about Divans tyrannical rule. Mar Thoma church at this point passed a church resolution against Divan and independent Travancore which infuriated the divan and ordered for the Metropolitans arrest and imprisonment. However the arrest order was not executed. It was all done at a point of time when other churches and communities of Travancore praised divan or feared to utter a word against the divan. Later the Mar Thoma church had to pay the price for that social action. The land allotted in the heart of Thiruvananthapuram to construct a church by Maharaja Sree Moolam Thirunal was taken back. Mar Thoma church was selectively targeted by Divan, by not giving permissions for construction of cemeteries and new church buildings. Thevarthundiyil Titus popularly known as Titusji was the only Christian in the band of 78 inmates selected by Gandhiji from Sabarmati Ashram for breaking the salt law at Dandi in 1930 (Popularly known as Salt March). In 1937 when Mahatma Gandhiji was touring Kottayam, Mar Thoma Seminary School opened its doors to Gandhiji. He stayed a night there with K. K. Kuruvila popularly known as Kerala Deenabandhu (because of his close association with C. F. Andrews Deenabandhu), then principal of the school, he was an MA graduate from Trinity College (Connecticut). Kuruvila was the founder of newspaper Kerala Bhooshanam which was active during movement for responsible government in Travancore during 1940s. K. C. Thomas (1901-1976) another noted freedom fighter of the era and once President of "Nivarthana Prasthanam" was in the thick of the agitations against Sir C.P. 's rule in Travancore. He was the secretary of the Jilla Committee of the State Congress was arrested along with Kannara Gopala Panikkar and jailed on September 21, 1938. Their Arrests led to wide spread protests in Chengannur and finally led to the infamous ‘Mills Maidhan Event’ on 28 September 1938 where Divans police used brutal force to dismiss the protesting crowd which resulted in blood shed. Cherian Thomas son of K.C. Thomas was actively involved with the Bhoodan Movement of Acharya Vinoba Bhave. N.G. Chacko, the freedom fighter plunged into freedom struggle during 1920. He was arrested and jailed for anti British protests and waving black flag in protest against visit of the Prince of Wales Lord Wellington, then Governor General in 1921. P.T. Punnoose is another leader of the era, he started his political activities through Congress party in 1938 however later he became a Communist leader. He was the Secretory of Travancore Communist Party and one of the organisers of the Punnapra Vayalar Revolt. He laid strong foundations for Communist party in Ambalappuzha, Cherthala and Alappuzha. He later was elected from Ambalapuzha Constituency to Indian Parliament. T. M. Varghese, a Christian among the trio who formed Joint Political Party was the voice against the despotic rule of Divan and spearheaded for the formation of a responsible Government. Another Mar Thoma Syrian and Gandhian of that era K.A. Mathew started his activities by writing articles in the magazine "The Christian Patriot" which articulated the dissemination of nationalist feelings among Indian Christians. In 1939 at Amsterdam when the union jack was raised in "International Christian Youth Assembly" for Indian delegates, K.A. Mathew raised the Indian flag in solidarity and carried along with him. Back in Travancore he was active in the movement against Divan Sir C.P. and his independent Travancore. He opposed a move among the Syrian Christians of Tiruvalla to erect a statue of Divan at center of the town. He was implicated in many false allegations and cases by the divan and jailed him many times. He was elected to legislative assembly in 1948. Barrister George Joseph a follower of Mahatma Gandhi and a Home Rule proponent mobilized the people in the Vaikom Satyagraha in early stages but later handed over the leadership to K. Kelappan as per the wishes of Gandhiji. During his stay in Madurai he was closely associated with labour union movement and worked in changing Criminal Tribes Act (CTA), which targeted specifically Kallar and Mukkulathor community. They affectionately called him Rosappu Durai (Master with a rose flower). He was a close friend of Kamarajar and Tamil Poet Subramanya Bharathi. Subramanya Bharathi Penned the patriotic song "Viduthalai Viduthalai" when he was staying at Georges home. Seven years prior to his death George Joseph joined Catholic church. Many young Syrian Christians who were staying in Singapore, Malaysia, etc. during 1940s was attracted to Netaji Subhas Chandra Bose and joined INA. O.C. Chacko a marthomite from Kuriannoor, Pathanamthitta joined with Indian National Army in 1943 when he was in Singapore. A Mar Thoma priest Rev. C.V. George from Ranny in his youth as an advocate was an active member in freedom struggle and was jailed for his involvement in activities against British Raj. He is the only Mar Thoma Priest who is recognized and awarded as a freedom fighter by the Government. After India attained its freedom in 1947, Government of India lowered to the level of a despotic rule during the time of Emergency of 1975. The Emergency was followed after election malpractices allegation and following the verdict against Indira Gandhi. All leaders who spoke against the Emergency rule were jailed or kept in house arrest. It was at this time Yuhanon Mar Thoma wrote a letter to Indira Gandhi, the then Prime Minister of India criticizing emergency and requesting to follow ideals of constitution. There were strong rumors about anticipatory arrest of Yuhanon Mar Thoma. M.M.Thomas another Mar Thoma Syrian and theologian advocating Ecumenism of Churches had written many articles on the emergency situation. In spite of criticism from many Christian group, M.M. Thomas made his point in depicting the basic fact of violation of human rights and stressed the need of the democratic organization of the people for the realization of social justice in India. Mar Thoma Church also passed a resolution against Emergency and for restoration of democracy privately. Mar Thoma church was also closely associated with the land for the landless and home for the homeless movement much before Acharya Vinoba Bhave initiated Bhoodan movement. Ramban Bible, Translated by Kayamkulam Philipose Ramban. The word 'liturgy' is derived from the Greek word 'Leitourgia' (Leitos/Loas: people+Ergos: work) which means a service rendered to God and people. When the Bible was not available, the liturgy took the role of the Bible, much of the scripture is formed in the liturgical context. The original liturgical language used by Malankara Church was Aramaic and Hebrew. The Bible that was in use also was in Hebrew. 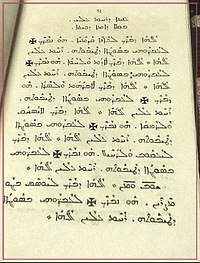 Later when Syriac replaced Aramaic in eastern countries, and the arrival of Knanaya people from Persia in AD 345, Malankara Church began using Syriac. The Bible used in Malankara Church is called the "Peshitta" and was in Estrangelo Syriac. This was the Bible that was in use till Malayalam (language of Kerala) translation was available. The first printed Malayalam Bible, translated from Syriac was published in 1811 by Philipose Ramban with the provision of Claudius Buchanan, known as Ramban Bible it contained the four Gospels. (A copy of this Bible was later presented to Dr. Buchanan and is kept in Cambridge University Library) By 1841, the whole Bible was translated, printed and released by missionary-scholar Benjamin Bailey with the help of Chandu Menon, a tahsildar in the Madras State service. It is interesting to note that even though bishops from Syrian churches visited Kerala, they did not attempt to change the Bible into the newer forms of Syriac or to the native language. In June 1876, Patriarch of Antioch Ignatius Pathrose IV, visited Kerala and a majority of Malankara Church accepted him as the head of their Church. But those who did not join them continued to follow their own leaders and kept their peculiar identity garnered from reformation. 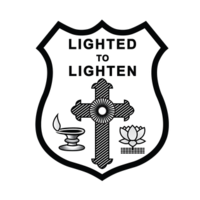 After Mar Thoma Church had begun to use the liturgy in mother tongue Malayalam, other churches continued to follow the same for a deeper engagement with the laity. A revised version of the ancient and apostolic liturgy known as People's liturgy, The Liturgy of St James (Gal.1:18-19) was adopted in the Church, later the liturgy has been translated into various languages including English, Hindi, Tamil, Telugu and Kannada. The Mar Thoma church follows the West Syrian liturgical tradition, and is Eastern in the nature of its worship and ethos. Those who were converted by St. Thomas in the 1st century continued worshiping in synagogues. Then they moved to their homes and by the 2nd century, they began to build their own churches (called ‘’Palli’’) in various places. It is believed that there were such small gatherings at Maliankara, Piravom, Niranam (Nelcynda) and Nilakkal. St. Thomas Christians in Kerala, still construct their churches combining the design of Solomon's temple at Jerusalem, and Indian Vastu Shastra. So from outside it looks like a Hindu temple but inside it is like a Jewish temple. It is divided into Sanctuary (Madbaha) and Nave (Haickala). Mar Thoma Churches are built east west with the Sanctuary (Madbaha) to the east. East is the place of the rising suns that is the symbol of the Risen Christ and His Second coming. East also symbolizes the Garden of Eden that was situated at the east. The Sanctuary is separated from the rest of the place by a veil with the sign of a cross. The worship of the Eastern churches symbolizes the heavenly worship. Madbaha symbolically represents Heaven and Haickala, the earth and veil the sky. The Madbaha is demarcated from the bema with an open arch and a veil. At the beginning of Holy Qurbana Service the veil is drawn from right side to left. Mar Thoma Syrians have abandoned the West syriac tradition of erecting more than one Altar and Madhbaha in Church and also forbade dedication of Altar/Thronos in name of a Saint or a Holy church father and conducting Holy Qurbana at Altar simultaneously or separate. The pulpit and lectern are also usually found at the extension of the bema. Bema is demarcated from the nave and transept(widely uses a vestibule space before the nave) with altar rails. The Choir is seated at one end of the transepts in the same level of the nave. Now there is a tendency to follow western architectural designs and introducing ciboriums, semi-domes...etc. 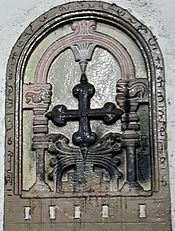 Cross used in Mar Thoma Church Chancel particularly at the center of the Altar is the Easter Cross. In Mar Thoma worship practice the visual Sign of the Cross is used many times. When the Priest gives the blessing he performs the sign of the cross; the worshipers, as a sign of accepting the blessing also reciprocates blessing oneself. The same is done at the time of the declaration of the Trinity and also at the time of indication of the Cross. Generally iconostases, pictures or statues of saints are not kept in Mar Thoma churches. Until the middle of the 20th century, all worshipers were seated on a mat spread on the floor. Children occupy the first rows and behind them on right side females and towards left males are seated. A narrow space between left and right is demarcated with a red carpet starting from the main door signifying that the church is sharing the worship space of heaven and joining the communion. Now many churches provide chairs or benches. During the Passion week services, chairs are removed, to facilitate worshiping according to their ancient custom, which includes prostrating a number of times. Everyone including clergy and the laity, who take part in the worship, faces east for the service. Mar Thoma Church's evolution from a reformation base only strengthened it to follow best practices of its Syriac traditions. Lents (Nombu) and other church festivals are church's structural and liturgical base. Feasts and fasts are the integral part of the traditions of a Christian community. However the way believers follow these fasts and feasts differs from church to church. Mar Thoma church being a part of Antiochian tradition churches, follows all the canonical feasts and fasts which are related to important events in life of Jesus Christ. The constitution of the church states that the feasts, fasts or lents are not to be removed or altered from church at any time. It Includes Observance of the Sunday as the day of the lord and other fast and feast days in church calendar. Each Sunday is dedicated to meditate on subjects prescribed in church lectionary. Great Fast: consists of 40 days from second week of February (Petrutha:Reconciliation) ending with 40th Friday, this symbolizes the forty days fast of Jesus Christ in the desert and extends with a ten days fast, that signifies the betrayal, passion and crucifixion of Jesus Christ (Passion week-Hasha) as per oriental tradition. It spreads to 7 weeks with a total of 50 days (Ambathu Nombu). Ash Wednesday is the first Wednesday of the lent, it is not observed with significance. Nativity Fast (Yeldo lent): 25 days prior to Christmas which includes annunciation to Zechariah and to Joseph. Fast of Nineveh (Lent of Yonah): 3 days in January. Apostles' Fast (Lent of Sleeha's): 13 specific days from second week of June. Roohanaya Festivals- Festivals related to Holy Spirit. Mainly they are Suloko (Feast of the Ascension), Sunday of Pentecost or Trinity Sunday- It is fifty days after Easter Day (at times it is observed separately), it commemorates the descent of the holy spirit on to the Church, Day of Transfiguration- 10th week after the day of Pentecost, this is when traditionally low abv vinification is started at homes for Christmas. The Ethanaya Feasts Kudos Etho and Hudos Etho is in the second and third Sundays of November, it is also considered as the beginning of a liturgical year. The Holy week or passion week (Hasha) is the week before Easter and the last week of Great Lent, this includes Palm Sunday (Hosanna- Commemorating princely entry of Christ into Jerusalem), Maundy Thursday (Pesach- Commemorating last meal or passover of Jesus Christ with his disciples and the Holy Communion was instituted on this day), Good Friday (Holy Friday- Commemorating crucifixion of Christ at Golgotha), Joyous Saturday, and Easter (Resurrection Sunday- Commemorating Resurrection of Christ). Christmas is celebrated by all members of the Church, to commemorate the birth of Jesus Christ. During this time, parishes will be involved in Christmas carols and the celebration of Christmas Day church services with Christmas cakes. Before 1850s, Mar Thoma church celebrated Christmas on 6 January, the day of Epiphany. By the end of last century, Christmas trees, Christmas Stars-an illuminative paper decoration made in the form of star or sunburst, Christmas lights, Sky lanterns, Nativity crib, Santa Claus' and other related festive traditions have appeared in the church. Development Department; Christian Agency for Rural Development (CARD); Mar Thoma Medical Mission; Mar Thoma Sabha Mandiram Fellowship; Social Welfare Institutions; Theological Institutions; Educational Institutions; Technical Institutions; Study Centres; Church Animation Centre; and Camp Centres are other empowerment organizations of the church. Nine colleges, six higher secondary schools, one vocational higher secondary school, eight high schools, one training school, five technical institutions plus other educational institutions owned and managed by individuals and by parishes. There are 38 social welfare institutions, 14 destitute homes and ten hospitals. The Mar Thoma Theological Seminary, Kottayam (established 1926) & Karukachal (Annex), Dharmajyoti Vidyapeedom, Haryana, E.J. Institute of Evangelism, and 4 other institutes cater to the theological education of both the clergy and the laity. Three study centres at Managanam, Kottayam and Trivandrum for arranging regular study programs and to provide opportunities for creative dialogue between Church and society on various ethical, moral, social and religious issues. The religious education of children is looked after by the Sunday School Samajam (organized in 1905) and the work among youth is carried on by the Youth Department, (the Yuvajana Sakhyam organized in 1933). The Church has a Women's Department (the Mar Thoma Suvisesha Sevika Sanghom organized in 1919). The Mar Thoma Evangelistic Association, the missionary wing of the Mar Thoma Church, is in charge of organising the Maramon Convention, One of the largest annual Christian gathering in Asia. It takes place in Maramon, near Kozhencherry, during February on the vast sand-bed of the Pampa River next to the Kozhencherry Bridge. The first convention was held in March 1895 for 10 days. The Maramon Convention is principally an assembly of Christians who once a year go there to listen to the gospel as read and expounded by Christian leaders from all over India as well as abroad. This provides a revived ideological and experiential faith in accordance to the need of the laity and period of time. It is in attune with Mathew 6:5. Attendees sit on the sand bed, Old and invalid people are given chairs with separate sponsored or paid seating arrangements. Generally, one session is for ecumenical messages by invited leaders of other churches. The church actively participates in the programs of the World Council of Churches, the Christian Conference of Asia, the National Council of Churches and the Kerala Christian Council. Mar Thoma Church was attending meetings of World Council of Churches from its first meeting in 1948 at Amsterdam. At the WCC meetings held in Evanston, Juhanon Mar Thoma Metropolitan was elected as one of its presidents. Since then the Church representatives attended all the General meetings. There is a historic relationship between Mar Thoma Syrian Church and Malabar Independent Syrian church . Both the churches are in communion relationship, although the doctrinal positions are not mutually accepted in full.Church Of Thozhiyoor (Anjoor) and its primates have come in rescue of Malankara church many times. After the demise of Pulikkottil Joseph Mar Dionysious (Mar Thoma X) and Punnathra Geevarghese Mar Dionysious, Kidangan Geevarghese Mar Philoxinos of Thozhiyoor Church reigned as Malankara Metropolitan as per the Royal Proclamation and returned the title back to Malankara Church without any claim after consecrating Punnathra Geevarghese Mar Dionysious and Cheppad Geevarghese mar Dionysious for Malankara church . Similarly in 1863 Malankara Metropolitan Mathews Mar Athanasious defended Thozhiyoor Church as an Independent Syrian Church in Madras High Court against Euyakim Mar Koorlos Design to Subordinate Thozhiyoor church under Antioch.From that verdict on wards Church of Thozhiyoor came to be known as Malabar Independent Syrian Church. When the Metropolitan Thomas Mar Athanasius died without consecrating a successor in 1893, it was the Metropolitan of the Thozhiyoor Church who consecrated Metropolitan Titus I Mar Thoma, and helped the Mar Thoma Church in a serious crisis. Mar Thoma Metropolitans have since then helped in consecrating the Metropolitans of Thozhiyoor Church and vice versa. According to the constitution of the Thozhiyoor Church, when difficulties arise the Thozhiyoor Church should seek the advice and guidance of the Mar Thoma Metropolitan despite the fact that either Church has no authority over the other. Thus the relation between the Thozhiyoor Church and Mar Thoma Church is unique. The centenary of the fraternal relationship between the two Churches was celebrated in the Sabha Mandalam on September 14, 1994. Mar Thoma Church has special regards and respect to Syriac Orthodox Church .The Apostolic succession of Mar Thoma Episcopacy, St James liturgy, Ecclesiastical tradition and order are all from West Syriac Tradition of Antioch. The First Reforming Metropolitan of Malankara Mathews Mar Athanasious was ordained to ecclesiastical orders by Patriarch Elias Of Antioch in 1842. After Demise of Mathews Mar Athanasious, the ecclesiastical robe and other insignia were sent to Patriarch of Antioch as per tradition . It was later returned to Mar Thoma Church during the time of Patriarch Zakka I. Patriarch Ignatius Zakka I and Patriarch Ignatius Aphrem II has visited Maraman Convention and blessed its faithful. Mar Thoma Church has made a convention or practice that it will never consecrate a bishop with the name Ignatius The Ecclesiastical Title of Patriarch. Other Malankara churches started consecrating their own Holy Muron, Mar Thoma church still have not done that. Mar Thoma church hitherto have been increasing and using the holy muron Consecrated by Patriarch Elias and brought to Malankara by Mathews Mar Athanasious in 1842. Mar Thoma church maintains good relation with Jacobite Syrian Christian Church .There is an active ecumenical dialogue between Syrian orthodox church and Mar Thoma Church for mutual acceptance and wider communion. Malankara Mar Thoma Syrian Church and Malankara Orthodox Syrian Church have the same Malankara antiquity and heritage that dates back to Saint Thomas' mission in Kerala, as well as West Syriac St James liturgical traditions dating back to the Puthencoor faction. These churches are often referred as Swadeshi Churches as both have their spiritual and temporal leaders based within Kerala, India unlike many other Christian Churches of Kerala. However, there is no official Holy communion relationship between both the churches. At the same time, both clergy and laity come together in matters of social and public concern. Ecumenical worship services during Christmas season is common outside Kerala among the diaspora, and also at many places within Kerala. There are many church leaders in both the churches who are widely respected across the larger Syrian Christian community, irrespective of their individual affiliation. Mar Thoma church has established an internal tradition that it will never consecrate an Episcopa or Metropolitan with the Greek name Baselios, as this is the name given to the primates of the Indian Orthodox Church holding the ecclesiastical title of Catholicos of the East. Both churches believe that their Primates are occupying the Ecclesiastical Throne of St Thomas. The Mar Thoma Church is in communion relationship with the Anglican Communion. The relation with the Church of South India (CSI) and the Church of North India (CNI) has evolved to a higher level as the Communion of Churches in India. In the United States, the Mar Thoma Church is in full communion with the Episcopal Church The Mar Thoma Church has concluded its ecumenical dialogue with the Old Catholic Churches of the Union of Utrecht in 2014. This dialogue is in the process of reception. There is an ecumenical dialogue of the Mar Thoma Syrian Church with the Lutheran churches. The church maintains friendly relations with the Syro-Malabar Catholic Church and the Syro-Malankara Catholic Church; but the Catholic doctrines are not accepted by Mar Thoma church in their fullness. The Mar Thoma Church keeps a multifaceted approach in these relationships by adapting to spiritual and cultural environment of the communions yet strongly abiding with the Mar Thoma Syrian identity. The Mar Thoma Church also keeps good ecumenical relations with other Christian churches around the world. ^ a b c "Mar Thoma Syrian Church of Malabar". Retrieved 5 March 2015. ^ Gregorios, Paulos; Roberson, Ronald G. (2008). "Syrian Orthodox Churches in India". In Fahlbusch, Erwin; Lochman, Jan Milič; Mbiti, John; Pelikan, Jaroslav; Vischer, Lukas (eds.). The Encyclopedia of Christianity. 5. William B. Eerdmans Publishing. pp. 285–286. ISBN 0-8028-2417-X. Retrieved 29 March 2010. ^ a b Mathew, K. S. (1993). The Faith and Practice of the Mar Thoma Church. ^ a b Neill, Stephen (2002). A History of Christianity in India: 1707-1858. Cambridge University Press. p. 250. ISBN 0521893321. Retrieved 19 February 2016. ^ "Mar Thoma Syrian Church of Malabar". www.marthoma.in. Mar Thoma Syrian Church. 2012. Retrieved 28 September 2012. ^ Neill, Stephen (2002). A History of Christianity in India: 1707-1858. Cambridge University Press. p. 251. ISBN 978-0-521-89332-9. ^ Neill, Stephen (2002). A History of Christianity in India: 1707-1858. Cambridge University Press. pp. 252–254. ISBN 978-0-521-89332-9. ^ "Official site of East Kerala diocese STECI". Archived from the original on 2 February 2017. Retrieved 1 February 2016. ^ Adherents.com (1999). Accessed 2012-06-04. ^ "Malankara Mar Thoma Syrian Church". Malankara Mar Thoma Syrian Church Website. ^ Geddes, Michael (1694). History of Church Of Malabar. ^ "Mar Thoma Syrian Church". marthoma.in. Mar Thoma chuch. Retrieved 18 July 2016. ^ Iyer, Rao Bahadur Ananthakrishna (1926). Anthropology of Syrian Christians. Cochin: Cochin Govt Press. p. 43. Retrieved 18 July 2016. ^ "Rev Geevarghese Mar Athanasius Suffragan Metropolitan passes away". OnManorama. ^ "Syrian Christian of Kerala". Encyclopedia of World Cultures. Retrieved 8 May 2016. ^ "Synod of Diamper". Encyclopædia Britannica. ^ ‘’Bible’’; I Kings. 9:26–28; 10:11,22; 2 Chronicles: 8:18; 9:21. ^ Kerala Council for Historical Research findings in 2005–10. ^ Yiśraʼel, Muzeon (1995). The Jews of India: A Story of Three Communities. UPNE. p. 27. ISBN 978-965-278-179-6. ^ Weil, Shalva. "Jews in India." in M. Avrum Erlich (ed.) Encyclopaedia of the Jewish Diaspora, Santa Barbara, USA: ABC CLIO. 2008, 3: 1204–1212. ^ Mathew, N.M. Malankara Mar Thoma Sabha Charitram, (History of the Mar Thoma Church), Volume 1.(2006). pp. 68-69. ^ "The Gospel of Thomas". Retrieved 5 March 2015. ^ "Mission of Saint Bartholomew, the Apostle in India". Nasranis. Retrieved 5 March 2015. ^ Canons of the Synod of Diamper (Malayalam version) and Travancore government records of that period. ^ Church History of Eusebius Book V, Chapter 10. ^ Mathew, N. M. (History of the Mar Thoma Church. (Malayalam), Volume 1. pp. 92-94 and souvenirs published by Knanaya parishes in Kerala. ^ "Indian Christianity". Retrieved 5 March 2015. ^ McCrindle, J.W. The Christian Topography of Cosmos, pp. 91–128, Book 3. ^ Mathew, N.M. (2003) St. Thomas Christians of Malabar Through Ages. p. 76. ^ Mathew, N.M. Malankara Marthoma Sabha Charitram, (History of the Mar Thoma Church), Volume 1. p. 98. ^ Mathew, N.M. (2003) St. Thomas Christians of Malabar Through Ages. pp. 76–77. ^ Mathew, N.M. Malankara Marthoma Sabha Charitram, (History of the Mar Thoma Church), Volume 1. pp. 99-100. ^ Marco Polo. The Book of Travels Translated by Ronald Latham. 1958. p. 287. ^ Sreedhara Menon, A. A Survey of Kerala History.(Mal). p. 54. ^ The Missionary Register for M DCCC XXII. October 1822, Letter from Punnathara Mar Dionysious (Mar Thoma XI) to the Head of the Church Missionary Society. From a translation of it, out of Syriac, by Professor Lee. pp. 431–432. ^ "The history of church of Malabar(written on background of synod of diamper, Micheal Geddes 1611, Internet archive BOOK)". ^ a b Buchanan Rev. Claudius, Memoir of the Expediency of an Ecclesiastical Establishment for British India. Page 76. ^ ‘’Niranam Grantavari, Record of History written during 1770–1830’’. Chapter 25. ^ The CMS ‘’Missionary Register’’, January 1816, pp. 37–38. ^ ‘’Niranam Grantavari, Record of History written during 1770–1830’’. Chapter 29. ^ The CMS ‘’Missionary Register’’, January 1818, pp. 103–108. ^ Cheriyan, Dr. C.V. ‘’Orthodox Christianity in India.’’ page 279. ^ Mar Thoma Sabha Directory (1999), p. 24. ^ Memorandum issued by Abraham Malpan along with eleven other clergy on 6 September 1836. ^ Royal Court of Final Appeal, Case No:III of 1061, Vol III pp. 26, 27. ^ "Ramban Bible Malayalam : Kayamkulam Philipose Ramban : Free Download & Streaming : Internet Archive". Internet Archive. Retrieved 5 March 2015. ^ Zac Varghese & Mathew A. Kallumpram. (2003). Glimpses of Mar Thoma Church History. pp.33. ^ Mar Thoma Sabha Directory. (1999). pp. 82-89. ^ Agur, C.M. Church History of Travancore.1903. ^ Mathew, N.M. (2007). Malankara Marthoma Sabha Charitram, Volume II. 2007. Page 63. ^ Varughese, Rev. K.C., Malabar Swathantra Suryani Sabhyude Charitram.1972. ^ Kanaka Jubilee Grantham. Cherthala: SNDP Yogam. 1952. p. 151. ^ Mathew, K. M. (2010). Ettamathe Mothiram. kottayam: malayala manorama. ^ "Dandi march". News paper article. ^ "Bapus Foot Soldier". News paper article. ^ "Gandhi Museum". News paper article. ^ Compilation. The political past (PDF). Mahatma Gandhi University. p. 3. ^ Chacko, N G (16 June 2007). "Freedom fighter dead". the hindu. the hindu. Retrieved 6 April 2016. ^ "TM Varghese". News paper article. ^ "National freedom". News paper article. ^ "K.A. Mathew, Malankara Tharaka pp. 27–29". Magazine article. ^ Mathew, George (1989). Communal Road to secular Kerala. Concept Publishing Company ltd. p. 232. ^ Joseph, George (2003). George Joseph, The Life and Times of a Kerala Christian Nationalist. Orient swan. ISBN 81-250-2495-6. ^ "Christian Response to Emergency 1975". Essay article. ^ "Christians of St Thomas and their liturgies (Rev GB Howard 1868, Internet Archive BOOK)". ^ Daniel, Rev Joseph. Fasts and Feasts in Mar Thoma Church: Fire for the Journey of Faith. University of Bern Switzerland. ^ James, mariamma. Faith and Practices of the MTC (PDF). ^ Synod, Marthoma. Pathinanchu Nombu Namaskaram (PDF). Thiruvalla: Mar Thoma press. Retrieved 4 March 2016. ^ Synod, Marthoma. Moonu nombu Namaskarakramam (PDF). Mar Thoma press. ^ Synod, Mar Thoma. Mar Thoma Lectionary 2015 (PDF). Mar Thoma press. ^ "Theological Institutions". Mar Thoma Church. Retrieved 26 February 2016. ^ "Kerala Council of Churches - Kerala Council of Churches". Retrieved 5 March 2015. ^ Swadeshi Church. "Swadeshi church". The Hindu. RSS. Retrieved 30 March 2016. ^ "About Us - Ecumenical Fellowship of Indian Churches in Philadelphia". www.philadelphiaecumenical.org. Retrieved 2 January 2018. ^ "A grateful heart: the foundation for evangelisation". catholicnews.sg. Retrieved 2 January 2018. ^ "Time for Christmas carols". The Hindu. 17 December 2007. ISSN 0971-751X. Retrieved 2 January 2018. ^ "Federated Faculty For Research In Religion And Culture (FFRRC): Orthodox Theological Seminary, Kottayam". www.ots.edu.in. Retrieved 2 January 2018. ^ a b "Koorthamala Orthodox/Marthoma Church - A Symbol of Christian Unity, General Interest Reading, Baselios Church Digital Library". www.malankaraworld.com. Retrieved 2 January 2018. ^ "Full Communion Partners | Episcopal Church". www.episcopalchurch.org. Retrieved 25 July 2016. ^ "Die Mar Thoma Syrian Church". www.utrechter-union.org. Retrieved 9 November 2016. ^ The Vatican II document, "Orientalium Ecclesiarum (Latin for "Of The Eastern Churches"), acknowledges and declares that Eastern Catholic communities are true Catholic Churches and not just sui juris rites within the Catholic Church. Richard P. McBrien, THE CHURCH: THE EVOLUTION OF CATHOLICISM (New York: Harper One, 2008), 450. Juhanon Mar Thoma Metropolitan, The Most Rev. Dr. (1952). Christianity in India and a Brief History of the Mar Thoma Syrian Church. Pub: K.M. Cherian. K. V. Mathew (1985) The Faith and Practice of The Mar Thoma Church. George Menachery (1973) The St. Thomas Christian Encyclopaedia of India Vol. II. Pothen, S.G. (1963). The Syrian Christians of Kerala. Asia Publishing House, London. Cheriyan, Dr. C.V. Orthodox Christianity in India Kottayam2003. Chacko, T.C. (1936) Malankara Marthoma Sabha Charithra Samgraham. (Concise History of Mar Thoma Church), Pub: E.J. Institute, Kompady, Tiruvalla. Daniel, K.N. (1924) Malankara Sabha Charitravum Upadesangalum, (History and Doctrines of Malankara Church). M.C.Chacko, R.V.Press, Tiruvalla. Daniel, K.N. (1952). Udayamperoor Sunnahadosinte Canonukal. (Canons of Synod of Diamper) Pub: C.S.S., Tiruvalla. Eapen, Prof. Dr. K.V. (2001). Malankara Marthoma Suryani Sabha Charitram. (History of Malankara Mar Thoma Syrian Church). Pub: Kallettu, Muttambalam, Kottayam. George Alexander, Rev.(Ed). Maramon Convention Sathapdhi Valum-’95. George Kassessa, Rev. M.C. (1919). Palakunnathu Abraham Malpan. (Biography in Malaylam), CLS, Tiruvalla. Mathews Mar Athanasius Metropolitan. (1857). Mar Thoma Sleehayude Idavakayakunna Malankara Suryani Sabhaudai Canon. (Canon of the Malankara Syrian Church of Saint Thomas). Printed at Kottayam Syrian Seminary. Mar Thoma Sabha Directory. (1999) Pub. The Publication Board of The Mar Thoma church, Tiruvalla, Kerala, India. P. V. Mathew. Nazrani Christians of Kerala (Malayalam) Vol.2 Kochi, 1993. Joseph Cheeran, Rev. Dr. Adv. P.C. Mathew (Pulikottil) and K.V. Mammen (Kottackal). Indian Orthodox Church History and Culture. (Malayalam) Kottackal Publishers, Kottayam. 2002. Mar Thoma Church Order of "Marriage Service"